Discover a new TriPeaks Solitaire experience from the makers of the #1 Solitaire game! It’s the perfect addition to your Solitaire collection. Download now! Feel like you haven’t won a deal in a while? Winning Deals guarantee that your deal will have a winning solution. Our TriPeaks Solitaire game gives you unlimited and unrestricted gameplay, so you can play to your heart’s content…no more waiting for the next TriPeaks level to unlock! We bring you the best TriPeaks Solitaire game in the App Store with unique animations, clean design, and simple gameplay. Celebrate your TriPeaks victory with our exclusive winning animations at the end of every deal. Keep track of your unlocked achievements and show off your scores in the leaderboards against TriPeaks players worldwide. 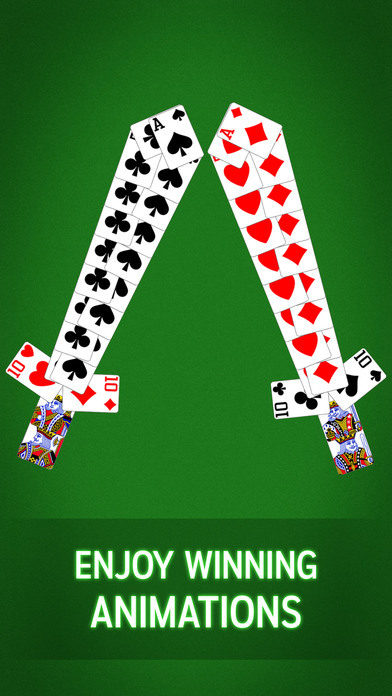 TriPeaks Solitaire is a variation of Golf and Black Hole, and is also known as Tri Towers, Three Peaks, and Triple Peaks.